John Ross Galbraith agonisingly missed out in a mass playoff as four of Ireland's eight strong challenge made the top 64 who qualified for the matchplay stage of the Andalucía Costa del Sol Match Play 9 in Spain. Derry’s Ruaidhri McGee (69) tied for third on seven under, two shots behind Stuart Manley and Hugo Leon with Michael Hoey (68) tied ninth on five-under, Cormac Sharvin (70) 23rd on three-under and Dermot McElroy (73) tied 44th on one-under par. Galbraith shot 68 to finish on level par but bogeyed the first extra hole to lose out in a six-way playoff for the last four spots on the par-three ninth. Mount Juliet's Gavin Moynihan — winner of the GolfSixes title with Paul Dunne recently — finished three shots further back after a 72 for his 11th missed cut in a row since last December. "I tweaked my back last Sunday in the final round and it’s getting a little worse," he said. "It hurts on my follow through and I didn’t want to risk making it worse. "I don’t think it’s a serious issue, but I'll get it checked out tomorrow. I didn’t feel playing through it was the best option for me with a long season ahead." In the top half of the draw, Sharvin faces Swede Niclas Johansson and Hoey takes on Switzerland's Joel Girrbach while in the bottom half, McGee meets Dutchman Will Besseling as McElroy takes on Poland's Adrian Meronk. Last to make the knockout stage were Spanish trio Mario Galiano Aguilar, Jose I Marin and Daniel Berna Manzanares, plus German Julian Kunzenbacher. They all progressed through the play-off at the end of Day Two on the par three ninth. All four carded pars whilst fellow play-off competitors Galbraith and Ben Parker bogeyed the hole. In the Belgian Knockout, Spain's Jorge Campillo shot a second successive 67 to top the 64 qualifiers on eight under as 11 players were forced to play off for the last eight spots after they tied on one-over par. 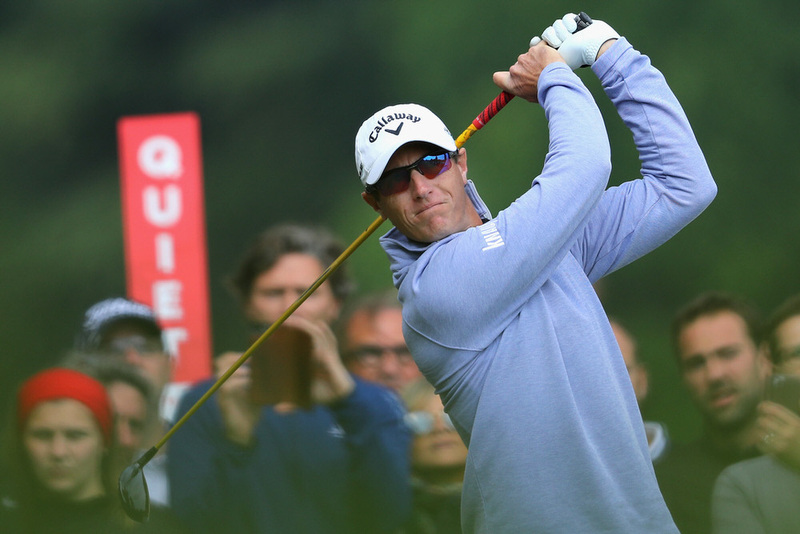 Home heroes Nicolas Colsaerts, Thomas Detry and Thomas Pieters all cruised into the weekend of the Belgian Knockout, when they will be among the 64 players battling it out in an exciting stroke play match play format. Day Two at Rinkven International Golf Club came to a dramatic conclusion as an 11-man play-off took place to decide the final eight players to progress. Romain Wattel and Ryan Evans were the 63rd and 64th players to earn their berths in the weekend action with a bogey each on the third extra hole. Jorge Campillo, one of the most in-form players on the European Tour with four top five finishes already this season, emerged as the top seed as the Spaniard boasted the 36-hole lead on eight under par following two 67s. Although the top 16 will enjoy a slight advantage with the luxury of knowing a draw in the opening match will see them progress to the next round, it really is all to play for at the weekend in Antwerp with every player in with a shout of claiming the title. The large home crowds at the beautiful tree-lined venue will be hoping one of their own can triumph and those chances remain strong, with Detry leading the Belgian charge courtesy of a six-under total for the regular stroke play stage, and Colsaerts and Pieters also through. “I played a solid two rounds and hit a bunch of greens. I'm happy with both rounds. Today it was cold in the morning and it wasn't playing easy the first few holes. Conditions were similar. “So it was playing easy. But this golf course, it doesn't play easy. It's a tricky course. It's a nice test. I wish it was a regular tournament in the position I am in right now, but it is what it is. It is better being on the top than on the bottom but you still have to win tomorrow. “It was pretty chilly this morning - no wind, so that was good. The ball was definitely not flying as far as yesterday afternoon, so we had to adapt a little bit but I’m very pleased with the way I was playing. “I played great today and I played great yesterday, a lot of fairways, a lot of greens. I could have made more putts but still very happy with the way I played. “It’s mission accomplished. The three of us have made it. I think there's four of us Belgians on the weekend. Let's hope that we get a good draw and none of us actually play against one another so we can maximize the chances to go far into this. “I knew I had to finish around even par or better, so I needed to putts to drop and luckily they did. It was a bit easier without the gusty winds and swirling winds, so I was pin-high a lot more today than yesterday, and that's why I made some more putts. “I've definitely enjoyed it. If I hit a good shot, and all the people are going nuts, it gives me chills just because they are my people and I know most of the people watching here. It's definitely a dream come true here.